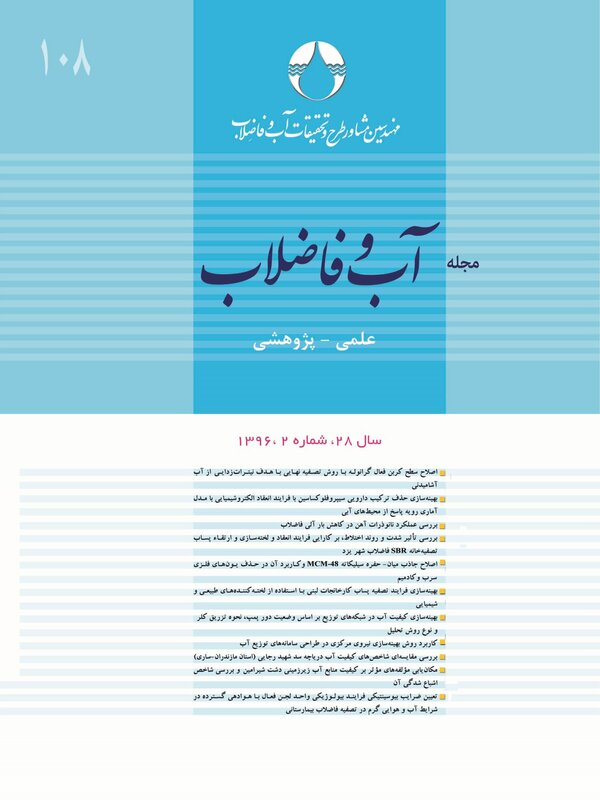 امروزه ارتقای کیفیت و اطمینان‌پذیری شبکه‌های توزیع آب با در نظر گرفتن محدودیت‌های اقتصادی در راستای تضمین بهره‌برداری بهینه از آنها، امری مهم تلقی می‌شود. به این منظور در این تحقیق برای تأمین اهداف حداقل نمودن هزینه کلرزنی و حداکثر نمودن قابلیت اطمینان کیفیت آب در شبکه‌های توزیع، بهینه‌سازی دوهدفه عملکرد این شبکه‌ها با استفاده از الگوریتم جامعه مورچگان بررسی شد. با منظور نمودن حالات مختلف، تأثیر ثابت یا متغیر بودن نحوه تزریق کلر و وضعیت دور پمپ با در نظر گرفتن انواع روش‌های تحلیل هیدرولیکی مبتنی بر تقاضا (DDSM) و مبتنی بر فشار (HDSM)، مورد بحث واقع شد. نتایج بررسی نشان داد که استفاده از پمپ دور متغیر و نرخ متغیر تزریق کلر در مقایسه با حالت ثابت آنها منجر به کاهش هزینه کلرزنی و تأمین قابلیت اطمینان کیفی در حد قابل قبول بدون نیاز به بوستر پمپ می‌شود. همچنین نتایج مقایسه کاربرد انواع روش تحلیل هیدرولیکی نشان می‌دهد که استفاده از روش تحلیل مبتنی بر فشار، کاهش هزینه کلرزنی و افزایش قابلیت اطمینان کیفی را به‌دنبال خواهد داشت. Recent years have witnessed a growing interest in the optimal operation of water distribution networks (WDNs) as a result of their enhanced quality and reliability with due regard for the economic limitations faced. For this purpose, the present study was designed and implemeted to realize the two objectives of minimizing disinfection costs and maximizing reliability of water quality in water distribution networks using the multi-objective form of ACO algorithm as the optimization method. Different system analysis methods based on DDSM (demand driven simulation method) and HDSM (head driven simulation method) were also employed to investigate and compare the effects of constant versus time-dependent chlorine injection and pump speed. Results indicated that, compared to the condition with constant parameters of chlorine injectuion and pump speed, great improvements could be achieved in enhancing the reliability of water quality and reducing disinfection costs by using variable speed pumps (vsp) and time-dependent chlorine injection regimes without the need for buster pumps. Comparison of the analytical methods employed also indicated that application of HDSM led to reduced chlorine injection costs and improved reliability of water quality. Afshar, A., Sharifi, F. & Jalali, M. R., 2009, "Non-dominated archiving multi-colony ant algorithm for multi-objective optimization: Application to multi-purpose reservoir operation", Engineering Optimization, 41 (4), 313-325. Babaei, N., 2013, "Optimizing pump performance and water quality in water distribution networks", MSc. Thesis, Department of Civil Engineering, University of Tehran, Tehran. Boccelli, D.L., Rossman, L.A., Tryby, M.E., Uber, J.G, Zierolf, M.L. & Polycarpou, M. M., 1998, "Optimal scheduling of booster disinfection in water distribution system", Journal Water Reserach Planing Management, 124 (2), 99-111. Broad, D.R., Dandy, G.C. & Maier, H.R., 2005, "Water distribution system optimization using metamodels", Journal of Water Resources Planning and Management, 131 (3), 172-180. Coelho, G.M., 1996, "Standardization of the preparation and quantitation of water-accommodated fractions of petroleum for toxicity testing original research article", Marine Pollution Bulletin, 40 (11), 1007-1016. Gibbs, M.S., Dandy, G.C. & Maier, H.R., 2010, "Calibration and optimization of the pumping and disinfection of a real water supply system", Journal of Water Resources Planning and Management, 136 (4), 493-501. Gupta R., Sushma D. and Pramod, R. B., 2009, "Water quality reliability analysis of water distribution networks", 33rd International Association of Hydraulic Engineering and Research Congress (IAHR), Vancouver, Canada. Hashemi, S. S., 2010, "Optimization of water networks by minimizing pumping energy", MSc. Thesis, School of Civil Engineering, Collage of Engineeirng, University of Tehran, Tehran. Hashemi, S. S., Tabesh, M. & Ataee Kia, B., 2012, "Scheduling and operating costs in water distributions networks", Proceeding of the ICE-Water Management, 166 (8), 432-442. Kurek, W. & Ostfeld, A., 2012, "Multi-objective water distribution systems control of pumping cost, water quality, and storage-reliability constraints", Journal of Water Resources Planning and Management, 140 (2), 184-193. Mehzad, N., 2011, "Multi-objective optimization of water distribution networks explotation, taking into account the effects of the pump and the tank", MSc. Thesis, Department of Civil Engineering, University of Tehran, Tehran. Murphy, L. J., Dandy, G. C. & Simpson, A. R., 1994, "Optimum design and operation of pumped water distribution systems", Proceeding Conference on Hydraulics in Civil Engineering, Institution of Engineers, Brisbane, Australia, pp. 149-155. Ostfeld, A. & Salomons, E., 2006, "Conjunctive optimal scheduling of pumping and booster chlorine injections in water distribution systems", Journal of Engineering Optimization, 38 (3), 337-352. Ostfeld, A. & Tubaltzev, A., 2008, "Ant colony optimization for least-cost design and operation of pumping water distribution systems", Journal of Water Resources Planning and Management, 134, (2), 107-119. Tabesh, M. , Azadi, B. & Roozbahani, A., 2011, "Quality management of water distribution networks by optimizing dosage and location of chlorine injection", International Journal of Environmental Resources, 5 (2), 321-332. The Standard and Industrial Research Organization, 1997, Physical and chemical characteristics of potable water, Standard No. 1053, Tehran, Iran. (In Persian). Vice President Strategic Supervision, 2013, "Design criteria for rural and urban water transmission and distribution systems", Journal of the First Review, Standard Code No. 117-3 (1st Revision). Wagner, J., Shamir, U. and Marks, D., 1988, "Water distribution system reliability: Analytical methods", Journal of Water Resources Planning and Management, 114(3), 253-275. Walski, T. M., Brill, E. D., Gessler, J., Goulter, L. C., Jeppson, R. M., Lansey, K., et al., 1987, "Battle of the network models: Epilogue", Journal of Water Resources Planning and Management, 113 (2), 191-203. World Health Organization, 2003, Chlorine in drinking-water, background document for development of WHO guidelines for drinking-water quality-health criteria and other supporting information, Originally Published in Guidelines for Drinking-Water Quality, 2nd Ed., Vol. 2., Geneva, WHO/SDE/WSH/03.04/45. Young, H. P., 1993, "An evolutionary model of bargaining", Journal of Economic Theory, 59, 145-168. Zecchin, A. C., Simpson, A. R., Maier, H. R. & Nixon, J. B., 2005, "Parametric study for ant algorithm applied to water distribution system optimization", IEEE Transactions on Evolutionary Computation, 9 (2), 175-191.